Each Region are meeting up twice a year in Regional Meetings. 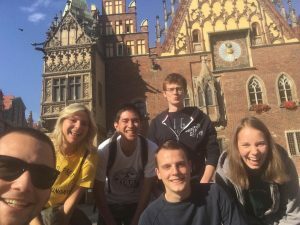 As you probably expect, 7 of our most motivated members travelled to Wroclaw to take part of amazing Region9’s Regional Meeting in Wroclaw, Poland. The Meeting started on the 17th of October and of course the place of the meeting wasn’t in the middle of the big city of Wroclaw but somewhere in the countryside around it. So after a two hours long bus drive we reached the accommodation where the organisers were patiently waiting for us. After a warm welcome we started Get To Know activities as there were many people we hadn’t met before. A Regional Meeting is a great opportunity to learn plenty of things about BEST, but not only. The sessions we attended, which were hold by formed BEST Trainers, can improve your soft and hard skills and these can be very useful in everyday life (school, job, other social activities, …) . 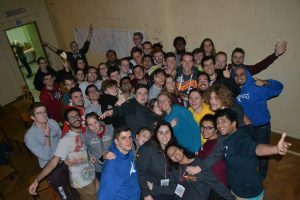 Of course the polish organisers were making sure that we had great times between the sessions and during the nights. Among others, an International Evening had been organised. There, each Local BEST Group represented their country with typical dishes or drinks that they brought from home. Everyone could taste a bit of everything so that people could discover a bit of other cultures. But unfortunately, every great adventure has to end. The Sunday 21st of October was the end of the event. Two of our seven members had to take a plane around noon that day so they left the accommodation very early in the morning. The 5 remaining people enjoyed two more days in Poland with a bit of sightseeing and came back to Belgium on Tuesday. We’re really thankful to the polish organisers and to the trainers. Thanks to them we had a great experience !